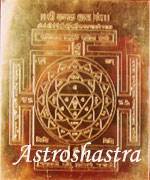 Jupiter Yantra/Guru Yantra is to appease the planet Jupiter/ Brihaspati. 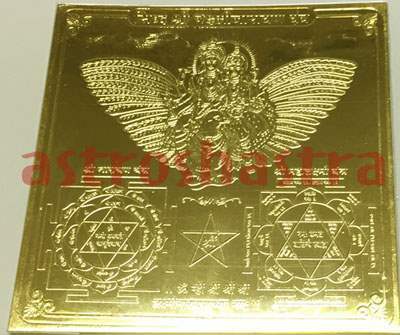 When Jupiter is malefic, the use of this yantra is very benefic and favourable. For those who are suffereing from piles, jaundice this yantra is recommended. Jupiter is a planet of expansion. It is also called Deva Guru. 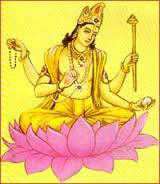 Jupiter is considered to be a teacher who removes the ignorance and darkness and offers wisdom by throwing light. It represents the "Sattvaguna" of the Hindus. It rules over man's worldly possessions and fortunes and hence is called the Giver or Ruler of money. It is the lord of finance and children. It governs education, happiness, health, love and respect towards elders and preceptors, good morals and conduct, wealth, respect, reputation and charity etc. It is embossed on Copper plate and is 24 caret Gold plated. It is to be kept on rising moon Thursday in your Puja Ghar. It negate the malefic effects of planet Jupiter and bestows power, rank and authority. It is best for profession and business. Those having Guru Chandal Yoga , a malefic yoga in their horoscope shall perform puja to this yantra or wear the yantra around their neck to negate the malefic effect of the yoga. 1. It is best for Students as it improves memory and analytic Qualities. 2. Those having malefic Jupiter in horoscope shall keep it with them.
" Om Graam Greem Grom Sa Gurve Namah"